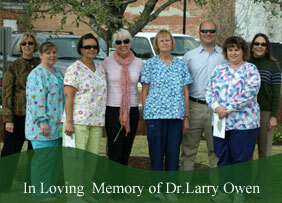 The Camden, South Carolina dental practice of Drs. Moss and Owen has been serving the community since 1980, creating a tradition of quality dental care that includes the routine general family dentistry you need to keep your teeth healthy, as well as the cosmetic dentistry that helps you achieve the look you want. Offering children’s dentistry, orthodontics, and restorative dental care, our office makes it easy for your entire family to receive the attention they need. It is the goal of our practice to partner with patients to achieve the best oral health possible by using the most current procedures and technology available to our professional staff. Our challenge is to provide each person, who confides in us for oral care, with the information and recommendations necessary to restore and maintain their teeth and supporting structures. Our goal is to provide excellent function, free of disease and pain, that is required for chewing, speaking and, of course, SMILING at an affordable cost. Medical science verifies the need to keep the mouth in a healthy condition. Most people who live to be 100 years old have some natural teeth remaining. Regular professional dental care plays a major role in making that possible. The doctors, hygienists, clinical assistants, and business office assistants of our practice are committed to continuous learning through off-site continuing education seminars, professional journals, staff development meetings, and consultation with industry experts. Each member of our professional staff must meet licensing regulations, as required by the State of South Carolina, and the standard of excellence as prescribed by the practice. In addition to keeping abreast of dental related conditions and treatments, we must remain informed of oral health risks associated with medical conditions, medications, and nutrition, as well as habits and conditions related to lifestyle preference. At Drs. Moss & Owen, our focus is you. Your goals are our goals. We take pride in our delivery of dentistry, and further, being functional and aesthetic cosmetic dentists. Our level of expertise focuses on your bite, TMJ, smile design and restorative needs. We combine over 40 years of caring, knowledge and experience. We all share in the belief of “caring for people” not just teeth. Drs. Moss & Owen is a unique place, where your desires, feelings and emotions are always the most important. We are here for you and provide complete comprehensive care that allows us to accelerate the process for you. That means fewer visits. You may have had unpleasant experiences or didn’t feel like you were listened to. Dentistry at Drs. Moss & Owen is a pampering and pleasant experience. We have music, blankets, heated back massagers, headphones, movies, and nitrous oxide (laughing gas) available to help you through visit. So if you are nervous, let us help find you a sedation solution and wake-up with a healthy mouth and healthy spirit for dentistry. Our goal is to ensure your experience exceeds your expectations of a dental visit in an environment that is warm, friendly and relaxed. We’re here for your oral health first and foremost, but relationships form the basis for creating lasting smiles. As a mother and son team, Dr. Cathy Moss and Dr. William Owen IV are the foundation of the family feeling you’ll get when you’re in our Camden dental office. Tradition, family, and history are important values for the Camden community, and you’ll see these values working in everything we do at the practice of Drs. Moss and Owen.